I just spent way too much time messing around with the font formatting on the first Whiteface post - below - and still didn't fix it. Arrg. Anyway, Whiteface Mountain is located in the town of Wilmington, NY. Wilmingtonites sometimes get appropriately put out when someone assumes Whiteface is in Lake Placid. Nope, it's not. Whiteface Mountain and Wilmington hosted the alpine skiing events for the 1980 Olympic Winter Games. You can ski the same runs on which Olympic athletes raced. You can also coast on the blue and green trails, or climb the slides to see if you're as good as you think you are. Whiteface is a very fun mountain to ski. Especially when you can see the mountain from where you are sleeping. Of course, we have some very nice listings in the Whiteface and Wilmington area. As I've said before, I work with the Prudential Terry Horrocks Real Estate Agency. There is a property on the AuSable River that is one of my favorites. It has an unparalleled and totally private setting directly on the West Branch of the Ausable River overlooking expansive meadows with direct views of Whiteface. You can literally watch trout swimming in the river from the master bedroom balcony. 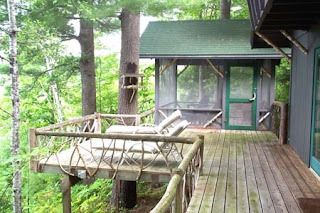 This three-bedroom chalet has been meticulously maintained and includes a large, wrap-around deck and screened room. The separate and recently constructed guest cabin includes a wood paneled bedroom/sitting room, a kitchenette, full bath and large deck overlooking the river. The setting makes you think of the word 'idyllic;' for skiers and hikers and anglers and anyone who appreciates the natural world. Let me know if you'd like to have a tour.